Imagine my surprise when I received a phone call from Elijah Johnson, Journalism Student at Bowling Green State University requesting an interview. Elijah is writing an article about the Flamingo Family here in Perrysburg. How wonderful is it that Elijah has chosen to focus on such a fun and uplifting art form for his paper???? The amount of time and energy that goes into these temporary forms of art are greatly appreciated by many and I'm thrilled they are again receiving attention for the gifts they give to complete strangers. 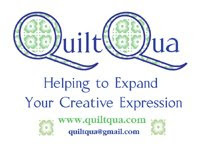 I have taken a break from blogging since May because I didn't feel like I had much enthusiasm for blogging about my quilting life or new products. I have continued to sew and I've made great progress on the hexi quilt I've been making that will be entitled, "Life." I put the sections together randomly based on nothing other than free flowing intuition. Each piece and part are a reflection of the process of life....sometimes it is beautiful, sometimes it makes sense, humor is reflected, sometimes cohesive....and then like real life....it gets dark and makes no sense in places. The quilt is approximately 50 x 60 at this point with areas still needing to be filled in. Each hexagon is 1/2 inch....about the size of a nickle....and with each piece needing to first be basted to the paper punched hexagon and then joined....each side requires 10-14 tiny stitches per side. So you can see I've been busy. Life is so unpredictable....in the last 5 months I felt calmly focused on just being....creating....and enjoying the people in my life. As many of you know, the grief of loosing my dear friend Mary Jane seemed insurmountable to me for quite some time. Just as the heavy weight of missing my girlfriend began to lift I learned my brother was killed by a hit and run driver in Hazel Park, MI earlier this month. I certainly don't want to bring people down....at the same time.....I have learned quite a bit recently and I believe that information would be very helpful to many others. If you are interested, you can see more on my Facebook page.